Vehicles parked illegally at Shannon Falls Provincial Park will be subject to towing at the owner’s expense. Visitors must park in designated parking lots and observe the “no parking” signs posted. Vehicles parked illegally in closed day-use areas will be charged a fee for gate unlocking. Thank you for your compliance. The tumbling waters of Shannon Falls originate from Mount Habrich and Mount Sky Pilot. This park is directly adjacent to Highway 99, making it a popular day-use park. This park provides picnicking, hiking and access to the trail in Stawamus Chief Provincial Park. For your convenience this park has a concession and information centre located next to the flush toilet building on the trail to the waterfalls. The small centre is managed by the Park Operator and offers food snacks, park and outdoor recreation information and souvenirs. Trail and stair treads may be slippery in the winter, please use extra caution and watch for falling ice. Visitors must stay on the trails and within the viewing area. Rocks and river edges can be extremely slippery. Reservations for the group day-use area are currently unavailable. The park is located just off of Highway 99, 58 km north of Vancouver and 2 km south of Squamish. Shannon Falls is immediately adjacent to Stawamus Chief Provincial Park. Squamish and Brittania Beach are the closest communities to the park. History: In 1792 Captain George Vancouver set up camp just west of the falls. The falls were named after Shannon who in 1890-1900 owned the falls and surrounding area and used the clay deposits to make bricks. He then sold the land to Brittania Copper Mines in 1900. In the 1930’s, the area was used as a relief camp for the workers building Highway 99. In 1976 the area was purchased by Carling O’Keefe Brewery, who used the pure mountain water to brew their beer, and made the area a logging show park. In 1982 O’Keefe donated the land to BC Parks. Throughout the park area there is evidence of logging activity that occurred here roughly 90 years ago. A number of excellent spring board notches on old stumps are scattered throughout the forested area and much of the deadfall also exhibits evidence of the logging techniques of this period. Culture: This park holds significant spiritual value to the Squamish First Nation, the first people to live in this area. They told of a two headed sea serpent, Say-noth-ka who lived in and around Howe Sound. According to legend this beast travelled both on land and in water. Some versions say it was Say-noth-ka who formed Shannon Falls by slithering and twisting his powerful body up the mountainside on repeated expeditions, Say-noth-ka gradually wore down a spillway for those cascading waters. There are climbing/rock climbing opportunities in this park. There are some multi-pitch and bolted routes; however, there are no designated trails to the climbing routes. The Best Practices Guide For Rock Climbing Route Development in the Squamish Area Provincial Parks is available here. [PDF 2.18MB] This Best Practices Guide recommends new guidelines and considerations for rock climbing route cleaning, including route development, and intends to balance climber’s needs with protecting the environment and public safety. Cycling is permitted on roadways and trails. There is an easy 350 metre long walking trail through a forest of Western hemlock, Douglas fir and Western red cedar along Shannon Creek which leads to the viewpoint. This viewpoint affords a spectacular view of the roaring falls. Be cautious of slippery wooden walkways and rushing water during heavy rains. Heavy rains can cause sudden increased volume in water flow and carry debris. 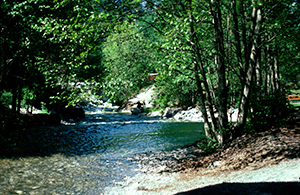 Wading in the creek or climbing onto rocks and torrent debris is extremely dangerous and not recommended. For your own safety and the preservation of the park, obey posted signs and keep to designated trails. Shortcutting trails destroys plant life and soil structure. There are viewing platforms in this park that offer spectacular views of Shannon Falls. This park is open during winter months with limited services. Access may be limited due to snowfall. A drinking water fountain is available at the washroom building during the summer season. It is recommended that park visitors bring their own water due to the small size of the drinking water fountain (not suitable to fill water containers). Most picnic tables are equipped with BBQ holders, bring your own briquettes. Reservations for the group site picnic area are available, but the group area does not have picnic tables. Click here for reservation information. A Park Use Permit is required for special events. Fires are not permitted in the day-use area. There are both flush and pit toilets available. Garbage bins are provided. The parking lots are extremely vulnerable to vehicle break-ins. This park is very busy during summer months and is frequented by several bus tour companies. The gate is closed between 10pm and 7am. Pit and flush toilets are located throughout the park. The flush toilet building is closed after Thanksgiving and re-opens aproximately May 15. There are wheelchair accessible toilets in the day-use area. Although the trail is not paved, the surface is a fairly packed crusher dust base trail which is suitable for most wheelchairs. A secondary trail, with an incline provides access to the viewing platform, although assistance may be required. There are also a few wheelchair accessible picnic tables and a drinking fountain.